We had such an amazing week together this week! Monday was hat day. We started off reading The Cat in the Hat by Dr. Seuss. We continued on to discover fun and interesting ways to balance our bodies like the Cat does in the story. During our small group instruction time, we tried to see how tall we could build the Cat’s hat! When some of them continued to break, the children got really crafty and chose to get the glue bottles and glue sticks from the art area! On Tuesday we had Wear Your Words day! We all wore as many words and letters as we could! We read the story 1 Fish 2 Fish Red Fish Blue Fish by Dr. Suess and then pretended to swim like fish! We also had different color gold fish crackers that we sorted and graphed by color. Once we sorted we practiced some data analysis skills and compared with colors had more and less than the others. During our Daily 5 time, Rayann read the children the story Brown Bear Brown Bear What Do You See! Everyone dressed silly and acted silly all day long! We signed in on pieces of paper that had been taped to the under-side of the tables! For small group time we held plastic writing papers up to our face while a friend tried to trace our facial features and make us look silly! We also got to turn a table upside down, cover it in plastic wrap and paint all morning! Last but not least, today was Pajama Day! Some of the children brought in some rhyming items to share with the class: (Sock/Rock, Bug/Mug, Dish/Fish, Quack/Black, Star/Car, Block/Rock). We read the story There’s a Wocket in my Pocket by Dr. Seuss. During rest time, the children were able to rest and read their books in the dark with their flashlights. Esma read the story Little Red Hen to the class during Daily 5 today! What a great week we had!! Just a reminder, next week there is NO SCHOOL for Spring Break. Please use this time to wash EVERYTHING (jackets, hat, gloves, blankets, backpacks etc…) to help keep our classroom germ free when we come back to school. The Influenza A virus has been busy this year! There seems to be a round of it going around – so I wanted to inform all of you of some things to be on the lookout for with your children. Also, just a reminder: for vomit, diarrhea and fever – every child must be symptom free, without medication, for over 24 hours before they can return to school. If you are ever not sure if your child should come to school, it’s always best to be on the safe side and keep them home to monitor them. Please click the links below for important information about Influenza A. This Wednesday, March 20th is when we will be going on our first BUS field trip! Every preschool child needs to have ONE ADULT come with them on the field trip. Due to space limitations, additional adults as well as siblings or any other children WILL NOT be able to attend this field trip. Please arrive at Whitmore-Bolles with your preschool child promptly at 8:45 AM. Cereal / milk will be served for breakfast for preschool students upon arrival at school. We plan to load the bus as soon as the buses arrive at the school (hopefully around 9:00 AM). Buses will not wait for anyone who is late. The school will provide a sack lunch for preschool children. All adults should plan to bring their own lunch & beverage (disposable packaging/containers only please). There is NOT any food available for purchase on this field trip. Food and drinks can only be consumed in the cafeteria area. (No eating/drinking on the bus or in the other areas of the Outdoor Adventure Center). You must stay within an arm’s reach of your preschool child during this entire field trip. We will ride the school bus from Whitmore-Bolles to the Outdoor Adventure Center and also return back to Whitmore-Bolles on the school bus. If you have any other questions, please reply to this post – or call Mrs. Laurus @ 313-827-6845 – or text Mrs. Laurus via Remind. Dearborn Public Schools Great Start Readiness Program (GSRP) is beginning the application process for the 2019-2020 school year. GSRP is a free program for all eligible families and is designed to give a high quality preschool experience prior to kindergarten. If your son or daughter will be four years of age by December 1,2019 please pick up an application. Salina Elementary, and Whitmore Bolles. 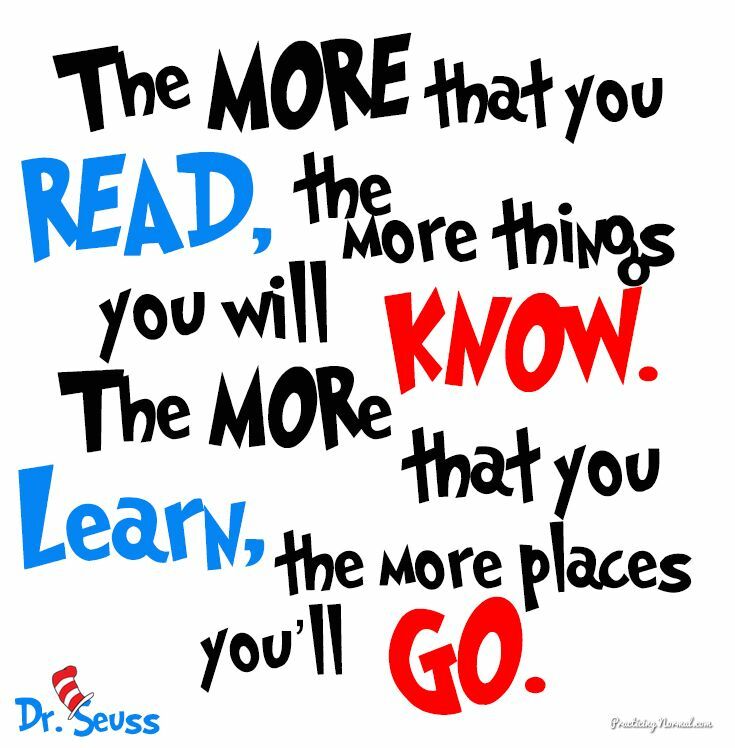 March 2nd is Dr. Seuss’ birthday! Dr. Seuss was a well known children’s book author who passed away back in 1991. Schools nationwide celebrate him – along with many other authors and illustrators during the month of March. March is known as “Reading Month” and we want Y-O-U to choose a day and time to come in to read a story to our classroom! Please contact me to let me know what day works best. You can bring in your child’s personal favorite story from home to bring in, or you’re welcome to choose a book in our classroom to read. You can read to the children in English, in Arabic, in Urdu, or any other language a member of your home might speak. The children also love wordless picture books! These are stories that only have illustrations and we use our imaginations to create the words ourselves! Kindergarten round ups are beginning to happen. The district schedule is available on this page (see “pages” tab) or on the dearbornschools.org website. The deadline for submitting nominations for Teacher of the Year is coming on March 8th. Click here to submit your nomination online before it’s too late! Please see me to sign up for parent-teacher conferences. Conferences will be held on March 14, March 21 and April 10. I have been meaning to add some pictures in from some of the learning that has been going on here in our class. We used unifix cubes to do some measuring. We discussed stacking the cubes end to end to create a line of cubes the same height/length as the item the children chose to measure. We also talked about counting each cube to see how many cubes tall or long the items were. Now that we have snow that is sticking around long enough to enjoy – the children also created pictures of what they like to do in the snow! Lamar created and designed her own school bus during work time! Here are a few pictures of the children enjoying their time in the snow. They have been busy creating snow angels, snow balls and trying to build snow men! Does your Child Play Baldi’s Basic? Today in class the children began talking about a new game they like to play. They have been talking about a game you can either watch, or participate in playing on YouTube. The name of the game is Baldi’s Basic. It is also called Baldi’s Education in School. Due to the name of this game, many parents think this game is educational. After our last parent meeting on Screen Time, I thought it was important to bring this newer game to everyone’s attention. This is a game that is phrased in such a way to essentially trick parents into thinking their children are learning while playing this game. I decided to do my own research. I visited the website www.commonsensemedia.org . This is the same website I informed all of you about at our parent meeting. I typed in Baldi’s Basic and this is the information I found out. Please be aware this game is NOT educational and is rated for children ages 13 years old and up. After what has been a crazy couple of weeks between ice, snow and extreme cold – it looks as though everything should be starting to get back to normal next week! In case you haven’t heard, we have some warmer weather coming our way. This means one major thing for preschoolers – MUD! Please make sure your child has a separate pair of either rain boots or snow boots they can wear outside, and a pair of shoes they can wear while they are inside the classroom. Please also make sure your child has a complete change of clothes inside their locker (pants, shirt, underwear and socks) for when we have friends who fall (or jump) in the muddy puddles while we are outside. Our field trip to the Outdoor Adventure Center is in the process of being rescheduled. It looks as though this field trip will be happening in March. We should have a confirmed date by next week for everyone to add to their calendars. One last update, we have a practicum student from the University of Michigan-Dearborn joining us in our classroom this semester. Her name is Ms. Etana and she will be with our classroom on Tuesdays and Thursdays in the morning from now through the end of April as she learns about early childhood development & learning and gets to see it firsthand in the classroom. I’m excited to see everyone back at school, ready to learn on Monday morning! If it is decided for Dearborn Public Schools to be open on Wednesday January 30th, then we will still go on our field trip to the Outdoor Adventure Center as planned. If it is decided for Dearborn Public Schools to close on Wednesday January 30th, then our field trip will be rescheduled for a later date. I will post the official decision via the Remind text messaging app. Welcome to Ms. Laurus' Preschool Blog! On this site, you will find important information, reminders, and upcoming events to keep you in the loop in preschool. You will also find pictures of your child learning in the classroom and participating through different parts of the daily routine.